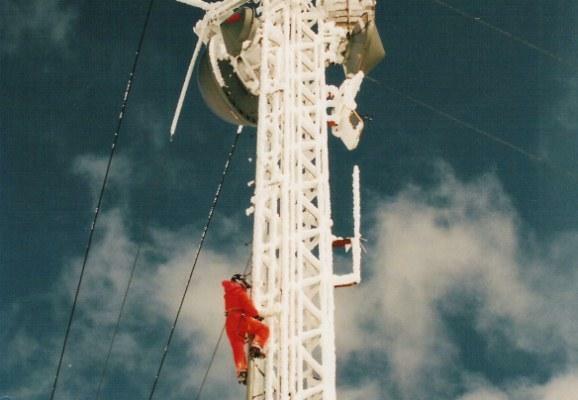 JPR Engineer Darin Ransom climbs the KSOR tower on King Mountain to make a winter repair. JPR operates one of the largest terrestrial broadcast networks in the United States. Much of our equipment is housed in remote mountaintop communication facilities that can be difficult to reach during harsh weather conditions. And, very few of these facilities have back-up electrical power making them susceptible to service interruptions when commercial power fails. Additionally, many listeners receive JPR via low-power FM translators which are not able to be monitored in our studios. Because of these factors, JPR relies heavily on listener reports of service anomalies, impairments and outages. Known impairments and/or outages will be posted to this page. If you're experiencing an interruption in your service please submit your report using the form below-- this will alert our chief engineer and also other key staff about issues that need to be addressed. When in doubt please let us know!